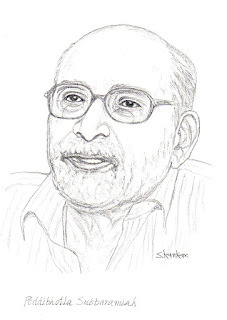 Sri Subbaramaiah garu, who worked as lecturer in Telugu in Andhra Loyola College, Vijayawada for 40 years and retired in 1996, is a noted short story writer in Telugu. People of my generation have grown up reading his stories – in fact we were enlightened by his stories about the “plight, anguish, frustrations and the jealousies of the middleclass people” of the 60s and 70s of AP. He also wrote a couple of novels but he was more known for his short stories that were closer to the reality. He had written more than 200 stories. He was conferred Central Sahitya Academy award for his collection of short stories in Telugu in 2012. His stories, that are mostly peopled by middle class Brahamins—for, to be authentic, familiarity comes handy, perhaps—narrate their aspirations, perspirations, frustrations and the challenges encountered in their wrestling for coming to terms with the changing society. His protagonists, being rooted in reality, never over-react to their sufferings but endure them silently as the given. His sense of empathy for his wide-ranging protagonists is extraordinary—we get to see a bit of their psyche, of course, fragranced by subtle philosophical pointers but sans preaching. His language is simple yet effective… easy to read and comprehend. As a writer he, simply narrating the plight of his characters, leaves them for the reader’s wit to infer. However, one common complaint of his stories is: melancholic violin phrases spiral upward from the pages. He passed away in Vijayawada on May 18, 2018, aged 79. As a humble tribute to this great teacher, novelist, and short story writer, I offer here one of his much-acclaimed stories, Inguva—a metaphorical explosion of truth—in English. “Yes…. Nothing is in our hands…” saying, walked into the front room. Offering a pot of water, Ramudu’s wife asked me to wash my feet. Pulling out a towel from the bag, moving to the edge of the veranda, washed my feet. As I came in wiping feet, a glass of water is kept ready for me on the centre table. Drinking it in one go, I could refresh myself. “Hu! … so it came to days now…!” said I. “That’s all … that’s it,” said Ramudu sadly. “Be brave… Nothing is in our hands,” said I again to him. Meanwhile, a girl saying, “taatagaru (grand Pa) opened his eyes and staring….”, walked in. Ramudu and along with him I rushed in anxiously. The room on the right-hand side is a small one. There is a cot by the side of the window. There, on it is Rajasekharam. Became quite thin… became almost a skeleton-like. Beard turned shabby. Lying flat on the bed, he is staring at the roof with wide-opened eyes. Sitting by his side, Ramudu said loudly, “Naannaa (Dad), look who has come…” Turning his face, Rajsekharam looked at me. After staring steadily for a few minutes, his eyes shined. Said something, but not audible. My eyes turned teary. Moving closer and laying my hand on him, stood there. I sat by his side on the cot. Meanwhile, he is stuck with a bout of cough. For a few minutes, he is wriggled by it. Recovering from it in a few minutes, he waved his hand indicating me to come closer. Leaning on to his chest, I sat there. “What do you mean?” said I. “I mean… What is inguva?” said again. In the very next minute he slipped into unconsciousness. His eyes closed. It nearly blew my mind. I came out. What a wonder? Ho! He could not get this doubt cleared for all these years! But how couldn’t he get such a small doubt cleared for all these years! We were schoolmates. Always used to move together. 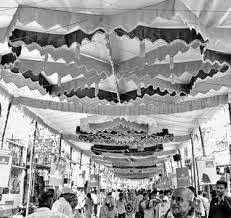 In those days, seeing us always together, some people used to call us ‘Ramu–Somu’; some used to call us ‘karatakadamanulu’. Our friendship was so strong that we couldn’t stay back without seeing each other even for a day. On completion of our studies, having got a job in revenue department, he went off somewhere. And I settled down as a teacher. Of course, I have been listening about him from time to time. Even our meeting each other continued though the frequency of face to face contact had, obviously, come down. Meetings have indeed become happenstances. Not being able to put up with that conversation, “What’s this … crazy talk?” said I. “No. No…listen, think seriously about it….”, said he. “Me too don’t know”, said I. “Many a time I made attempts to know it. Yet, the wonder is it never got cleared. Once I met a great physicist in the train. We spoke for long on various matters. Finally, as I thought of enquiring him about inguva, the train came to a halt and he hurriedly got down. Once I have asked even my son. Except to stare at me in wonder, he too didn’t say anything. Yet another time, I asked some other man who promised to consult someone and revert to me with the answer. But meeting me later, he said that he didn’t remember what I had asked for. And, my doubt remained as it is. “It will get cleared, after all, it’s not a great complexity, anyone can answer it”, said I. There after I have forgotten it. He too moved into some other plane. That’s all what happened that day. Got up … had bath and nibbling a few morsels of food lied down on the bed. Didn’t get sleep. Getting the news of his terminal stage a few relatives have come. Sitting on one side all those who had come are chatting. “Ensure one or the other sits by his side continuously watching him”, said someone. “It may be good to shift him well before … into the veranda …. for these are not auspicious days even…”, said another. It irked my mind. With his hard earnings, he had constructed this house with passion. Would they lay him outside now? “Bottom of the earlobes bend backwards. He may at times suddenly stir up or shiver wildly… change in breathing and jerking up of head, if noticed, he must be shifted to veranda immediately”, said another. I could not put up with all that any longer. Went inside and looked at him. “Ten minutes back he turned conscious and in the very next minute swooned again”, said his daughter-in-law. Came out and drinking the coffee that somebody passed on to me, I walked out of the house. It’s the same locale in which we lived in my childhood. But it has changed a lot. Once, there stood a government school. In its place a new building came up now. A little farther to it, there was a park. In that woods, amidst the big and small trees, we played all kinds of games. It now changed into a Municipal market. Once, there stood a grand new building… but now dotted by faded patches of history it is looking drab. A cheap hotel has now come up in it. The town has expanded in all directions, like the thoughts of a crazy fellow, haphazardly. All roads are flooded by people. Vehicles plying this and that side… their honking …everything looking chaotic … That cinema hall which looked pretty new when it was built, now lying between two newly built theatres… gives a pathetic look playing an old film, perhaps, wondering itself: “Could a poor survive amidst the wealthy!” There used to be many trees then but none exists now. Coffee of one anna (6 paisa) of those days is now costing four rupees! Went around looking for his house. After a long walk I could locate it. Opening the gate walked into their veranda and pressed the calling bell. A dog came out barking furiously. Right behind, a lady in fair complexion came out calling, “Tiger!” stared at me enquiringly. Introducing myself, enquired, “Is Ramesam in?” Perhaps wondering at my informal enquiry, she invited me in. “Please be seated…it’s time for him to return”, said she. Tucked myself in a sofa. Meanwhile, a smart girl walking in with a rocket in hand went inside. A while later a boy walking in with a load of EAMCET books went inside. Lying at the entrance, Tiger is watching silently. Closed my eyes for a while. Clock on the wall is showing the time as 8 p.m. Picking up a magazine from the central table, started turning the pages, wondering if Ramesam had gone for a movie! When he will return! Later she arranged for a glass of water. Enquiring about me she collected my whereabouts. I stood up with a smile. He became quite fatty. Side locks turned grey… Staring at me attentively, and recognising me, he, with a loud laugh, pulling me closer, hugged me. Saying, he, turning to her said, “Sarada! He would stay with us for today.” Thus pushing everybody on to their toes, he introduced me to his children. Cooling down, “if it’s urgent, OK! But then when?” questioned he. “Yeah! Sure, sometime later…” said I. “What! What!” saying he came nearer to me. Whatever she might have understood, she went inside. “About what!” asked he in surprise. He was shocked. Coming out of it after a while, looking at me quizzically, “Is this what you urgently needed,” said he. Later, making me comfortable and sitting close to me, calmly explained all about it. Then, staring at me as though stuck with a doubt, “for this pretty information, why are you so anxious?” said he. Saying, “Nothing much” … shall take leave of you”, hurriedly got up. “If you stay back in the town, do come tomorrow”, said he from behind. Coming onto the road in long strides, harping on to a rickshaw I reached Rajasekharam’s house within fifteen minutes. Coming nearer to me, Ramudu saying, “A while ago… as you went out… he opened his eyes… looked all around as though searching for someone … twice he shook his head and that’s all … everything was over,” he dumped himself on the ground. My legs became weak and shaking… dumped myself in one corner of the veranda. 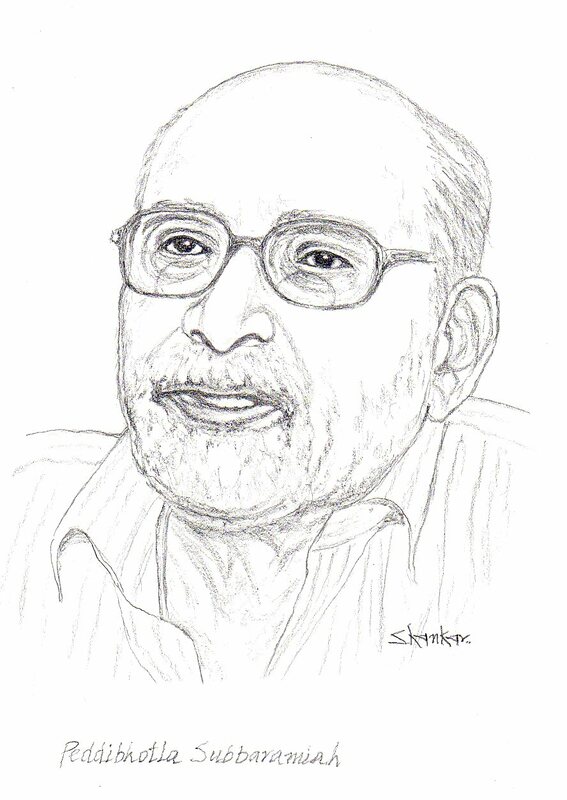 Acknowledgement: Thanks to Sri Sathiraju Sankara Narayana garu for the portrait of Sri Subbaramaiah.